The American Society of Clinical Oncology meeting was held in Chicago from 3rd to 7th June. This Annual meeting brought over 50,000 oncology professionals from all over the globe to discuss on the latest research of different cancer types. Medphine is proud to become a part of the most exciting event for Clinical Oncology practice and cancer care in Chicago. This annual meeting provide unique opportunities to cancer care communities and oncology practices to learn about the various areas that are under research and advancement such as medical, surgical, symptom management, radiation and geriatric oncology and pathology. This year’s meeting agenda was “Making a Difference in Cancer Care with You”. The theme focused on the quintessential need to create an engaged, well informed system of health care professionals to provide high value and high quality cancer care. ASCO meeting witnessed discussion panels, latest trends, showcase of innovative research and high calibre speakers from all over the world. In short, the main focus was on highlighting the various new oncology therapies under research and discussing the various ongoing controversy of the oncology field. One of the biggest buzzword floating around this year was state-of-the-art treatment modalities. 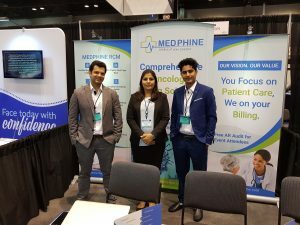 Medphine was honored to exhibit their booth, where we presented How quality services can help Oncology Practices cherish the fruit of a flourishing revenue cycle. Experiencing booth from behind was a unique experience for us as we were exhibiting in ASCO for the first time. We made the attendees understand the need to remain updated with new Regulations and Guidelines as the field of Oncology Billing and Coding is ever-evolving. 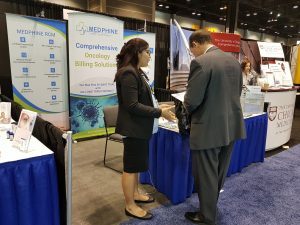 At ASCO, we even seized the opportunity to educate medical practitioners on how they can strive for effectiveness and efficiency in their medical coding and billing process. Reetu Singh (Founder and Director of Medphine) Oncology Billing and Coding Specialist – educated the attendees on How to maintain an effective billing cycle while taking care of their patients, How to maintain steady reimbursements and How to incorporate new developed drugs in their care without worry about the reimbursement. It effective claim processing, accounts receivable management, quality control assessments and many others. It was a treat to the eyes to see How Oncologists were actually very keen on understanding How our services can help them achieve a steady fast cash flow. There were schedules for group meetings with clinicians, researchers and others in different areas of medicine. The ASCO’s Patient Advocate Lounge was a dedicated space for making these meaningful connections. We learned and shared information with other attendees to apply it to our practices, mission and research. Our team met patients and partners to discuss advancement on the oncology programs and how we can meet the unique requirements of medical coding and billing for the caregivers. During the meeting, we witnessed groundbreaking research on various types of cancers and better patient care before it was available elsewhere. All these research undergoes review system to ensure best information is available to the attendees. As medical coding and billing company, Medphine never misses a single chance to learn more about the new advancements to offer patients with flourishing revenue cycle. We believe that information learned during presentation will help our services be more effective. Medphine looks forward to continue the effective work of medical coding and billing to meet the evolving demands of the healthcare industry.